There are many instances when we wish a child would behave differently. Sometimes, this leads to anger or frustration and we spin our wheels trying to get children to change. But what if we are the ones who need to change? Making a simple shift in the way we approach a child’s behavior can lead to big changes in how they act. That is demonstrated well in the graphic above. I came across it on the Facebook page for the MEHRIT Centre, an educational organization in Canada working to help parents and children learn self-regulation. The graphic was created by artist Kristin Wiens. 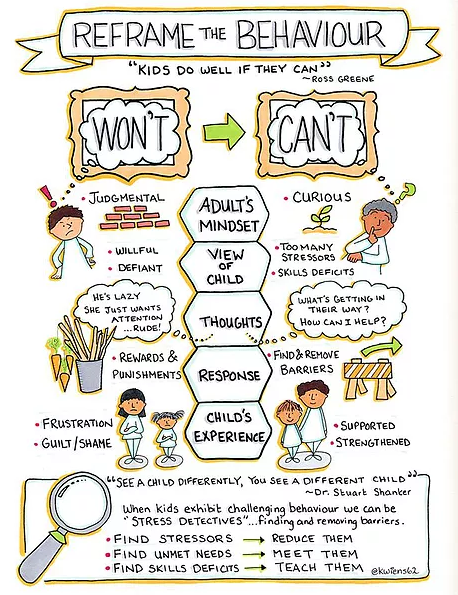 The sentiment at the heart of this graphic is that “kids do well if they can.” Although we often assume that a child can do something, like start their homework, they may not have the skills to make that happen. I find that one of the most powerful shifts is the first one, to move from judgmental to curious. Rather than being judgmental about why a student is not starting his homework (he is lazy, he has no ambition) one could shift their thinking and get curious about why he is not starting his homework (he does not know how to easily begin tasks, he is confused by the material and avoiding it, or he is struggling with an emotional issue that is making it hard to concentrate). This puts us on the child’s team and allows us to see the situation differently. We could ask questions of the child or look critically at the situation and ask ourselves how we could make the environment or circumstances better. Sometimes you will be able to do that on your own, and sometimes, you will need to bring in your own team to support your child. Making this shift will help improve relations with your child in those moments when what you want and what they need appear to be at odds.